UCLA sophomore Josh Shipp underwent successful arthroscopic surgery on his left hip Friday afternoon. The surgery was performed by Dr. Carlos A. Guanche at the Southern California Orthopedic Institute in Van Nuys. The procedure repaired a torn labrum (cartilage) and also included a removal of an area of bony overgrowth of the femoral neck. Rehabilitation should take 8-12 weeks and Shipp will spend the first month on crutches. Dr. Guanche is a family physician to the Shipp family. Approximately three years ago, he performed asuccessful arthroscopy hip procedure on Joe Shipp, Josh’s older brother. “I’m very pleased that the surgery was a successful one and look forward to Josh making a complete recovery,” UCLA Head Coach Ben Howland said. “He has ample time to recover and be ready to go at 100% full strength by the time we start back up again in October." Shipp was a major reason for the Bruins' success this season. Against Florida in the championship game, he scored a team-high 18 points. With the departure of Arron Afflalo to the professional ranks, Shipp will be looked upon next year to carry an additional load on offense. 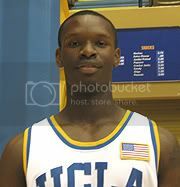 UCLA men’s basketball coach Ben Howland announced today that 6-foot-8-inch sophomore forward/center Ryan Wright will not be returning for next season. Wright, from Mississauga, Ontario, Canada will transfer to play his final years at another school. Wright will leave UCLA after the spring semester and hasn’t made a decision as to where he will transfer. "Ryan is an outstanding young man and we appreciate what he has done for this program over the past two years," Howland said. "He worked hard everyday, showed great improvement and was an important part of our run to back-to-back Final Four appearances. We wish him nothing but the best. "He will stay a part of the team and continue to work out with his coaches as well as his teammates during the spring. He will always be a part of the Bruin family and we appreciate all of his efforts over the past two years." Wright averaged 1.3 points and 0.9 rebounds per game while appearing in 28 of the 36 games without making a start during the 2006-07 season. He played in 150 minutes (5.4 minutes per game) while shooting 58.3 percent (14-for-24) from the field on the year. "After speaking with my family and thinking about it for a long time, I feel that at this point in my career, the best thing for me to do is to explore other opportunities," Wright said. "The coaching staff has helped me improve as a player and grow as a man and I am thankful to them for that. My teammates made me feel at home and I have a lot of great memories from my time here at UCLA." Hoopsters Awards/Dinner Banquet held at the Beverly Hilton. the Coach John Wooden Award last year with Jordan Farmar. averaging 7.4 rebounds per game (259 rebounds). was one of only four Bruins (Afflalo, Westbrook and Michael Roll were the other three) to play in all 36 games on the year. and 4.2 rebounds per game in his second season with UCLA. Two Bruins, sophomore forward/center Ryan Wright and freshman guard Mustafa Abdul-Hamid, shared the UCLA Faculty Athletic Representative Award (Academic Achievement and Team Contribution). Bob "Ace" Calkins Memorial Award/Free Throw Champion: Darren Collison. UCLA Faculty Athletic Representative Award/Academic Achievement and Team Contribution: Mustafa Abdul-Hamid and Ryan Wright.